Ross, R. 1947. Freshwater Diatomeae. In: Polunin, N. (ed. ), Botany of the Canadian Eastern Arctic. II. Thallophyta and Bryophyta. Bulletin, National Museum of Canada 97: 178-233. Phycology Section, Patrick Center for Environmental Research, Academy of Natural Sciences of Drexel University. Diploneis oblongella (NADED 30004). 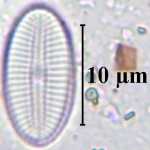 https://diatom.ansp.org/taxaservice/ShowTaxon1.ashx?naded_id=30004. Accessed 19 Apr 2019. This web service reports all information about a given algae taxon available at the time of retrieval.